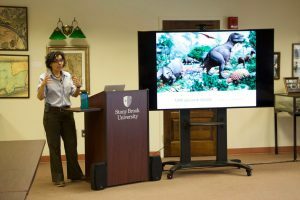 On April 3, Dr. Dávalos unfolded the mysteries of 5 mass extinctions and offered pivotal lessons for preventing future extinction. 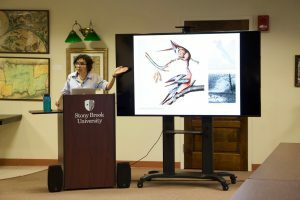 Using an example from the Caribbean, Dr. Dávalos described the end of glaciation that caused the bat extinction. On the other hand, there was a fossil study which revealed that climate change did not contribute to extinction. 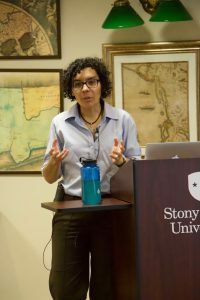 Thus, Dr. Dávalos combined results of her study and the fossil record to explore the human footprint deep in the past. As a conclusion, there is no one single cause for extinction. Extinction began before human arrival due to deglaciation and area loss. 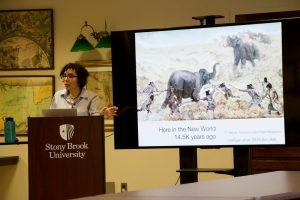 It also happened after human arrival due to hunting, ecosystem change, and invasive species. As the border between settled land and natural habitats plays a vital role in equilibrium, it is our responsibility to preserve natural habitats and connect the ecosystem for a sustainable future. It was a very intriguing lecture! Clara is the liaison to the Department of Chemistry, Electrical & Computer Engineering, Mechanical Engineering, and the Women in Science and Engineering program.